UPDATE MAY 2018: Unfortunately the hotel management changed and during a stay from 26-29 May 2018 noise from construction next to the hotel was encountered, insufficient housekeeping, inattentive service at breakfast, as well as lack of quality in terms of products were registered. Therefore the below written review and rating is no longer appropriate and value for money has been considered very bad. We do apologize for any inconveniences. Being a big fan of The Ritz-Carlton and Dorchester Collection - and after an unsatisfying experience at the Regent in Berlin one month ago - I was not only sceptical about the destination itself. However as open-minded travel bloggers it is a pleasure to visit new places and recently opened luxury hotels. So I see this summer holidays as a way to present newly opened hotels starting with the Falisia in Portopiccolo, moving further to the D-Resort in Sibenik and finally spending a week at the Regent Porto Montenegro before finalizing this trip at Villa Dubrovnik. All above the question about Montenegro as a luxury tourist destination, I posted another interesting article previously. So if you are now familiar with what to expect in this pretty wonderful country, I am glad to show you one of the most wonderful places to stay there: the Regent Porto Montenegro. In fact it is a grand looking hotel but the amount of rooms is on the lower side, making it a cozy boutique hotel with vast rooms (starting at 45 square meters)! When I arrived, I was welcomed by name and soon after the check-in procedere, the kind lady was showing me around the resort and finally accompanied me to my room. A wonderful Deluxe Sea View Room was waiting for me and I could not focus on what the front desk lady was saying, as I was just flashed by the amazing views over the artifical Porto Montenegro and the Bay of Tivat. Is this the Queen Victoria? Yes indeed, one of the biggest cruise ships was just making its way towards the famous Bay of Kotor! Amazing! What was the kind lady saying...? Well, maybe I am not the first one who lost the connection by this dreamy location :). Later I found out that I better should have payed attention to her as there is no list for the telephone numbers to dial to reach anyone, eg concierge or housekeeping. Before I could even enjoy a bath (obligatory when having a free standing bath tub inside a hotel room - since our stay at the Raffles Istanbul), I was already sitting on the hotel's golf cart bringing me to the Lido Pool... And yes it is even more spectacular then it looks on the pictures. A day bed normally costs 40€ per person, but Regent guests get it for 25€ pp. When I came back - I managed not to get a sunburn - there was still time to inspect the two hotel pools. There is one indoor pool with a jacuzzi ensuite and one large outdoor infinity pool overlooking the marina - personally I would recommend you to get there after being on the beach or Lido Pool, because it is the best place to spot the sunset. Next to the pools, there is also a Spa - unfortunately time was too short to experience their treatments. Before it was time to have dinner, I was looking around my room (finally!) and found a nice welcome letter (handwritten! Glad to see that some hotels have still time to do this) together with macarons and a bottle of local red wine. My entire room was super spacious and I even had an own terrace with two loungers. The bathroom? Heaven for all women, I guess. With seperated toilet and walk-in shower, free standing tub with window inside the bedroom ensuring views of the sea, double vanities and a make-up table with big mirror and lots of light. As usual at a Regent the toiletries were by L'Occitane. As it was Friday evening, everone was dressing up to attend the cocktail reception with the kind general manager (from Austria :) ) and his PR Manager Elena. They really are doing a great job! The complete garden in front of the lobby was decorated in such a romantic style and the offered cocktails did match perfectly with the setting. Andrija was one of the best concierges I have ever met. He did gave us the best tipps of the whole area: one amazing and top secret place above Sveti Stefan and another secret spot to overlook Boka Bay. I hope he won't give these amazing tipps to other guests, as long as they are not readers of the Travel Executive Blog :)). Another staff member to remember was Maria. She is responsible for all hotel guests at the secluded beach and is always ensuring that you have a good time! Thanks to all of them! For all those who cobine a trip to Montenegro with an Aman Experience, I would like to inform that the Regent is completely different, being a boutique hotel in a town with a lively atmosphere, whereas the Aman is a seaside getaway for all those who don't want to be seen and to hide inside the resort walls. Above all I need to say that during my whole one-week stay I was never unhappy and I am pleased to announce that complete Montenegro is fit for the international luxury jetset - in the real mid the super Regent Porto Montenegro as a serious and reliable international luxury hotel. 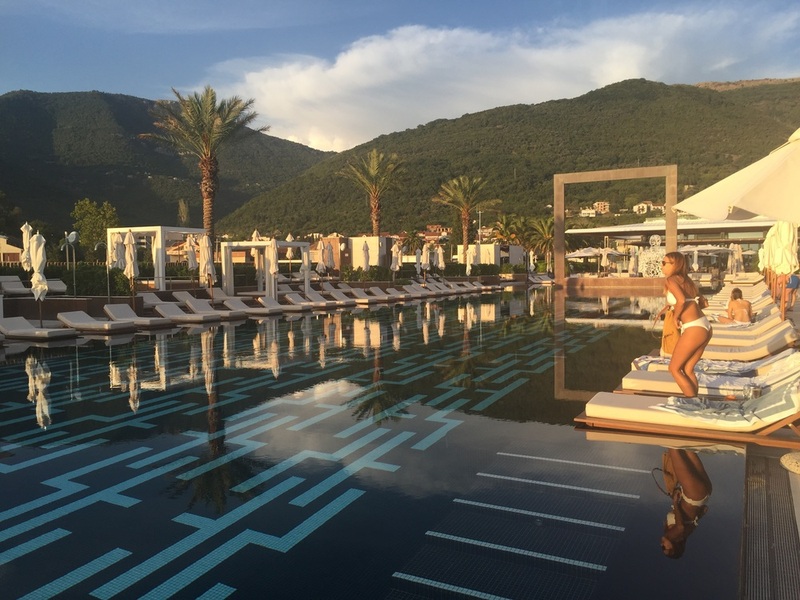 I was guest of the Hotel Regent Porto Montenegro and Porto Montenegro, however all above written expresses my own opinion and it has indeed been one of the best summers I have ever had.